The evil of John Howard and Philip Ruddock's extremo-conservative anti-refugee politics is exemplified in the drama on board of a ship and around Australia; it explodes in the disgusting treatment of rescue ship MV Tampa and its captain Arne Rinnan. Once again, we're presenting what now belongs to our recurring succes: enabling public film screenings. Replicating our acclaimed Fremantle event, we bring two movies to Bunbury. We present Angela van Boxtel's Award-winning Short movie "The Cage House" and a BBC documentary by Sarah McDonald and Kate Durham, "Australia's Pacific Solution". Previously we presented this exclusive BBC documentary at the Fremantle Film and Television Institute. Click here to view the page about that event. 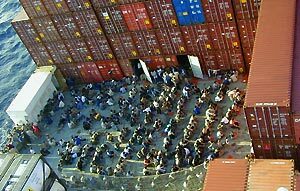 On June 20, 2003, we're showing both films at Edith Cowan University's Bunbury Campus, whilst commemorating World Refugee Day 2003. Liam Barry is a WA peace activist who was arrested by Israeli soldiers and detained while on an assignment in Nablus in May 2002, visiting the Balata refugee camp. Liam will tell his story at the event. For more information about Liam Barry scroll down the page or click here. "I talked to Australian tradesmen who boasted they were earning $5000 a week but they had to be secretive because they had to sign confidentiality agreements..."
"[Durham and Macdonald] went to the tiny island posing as tourists and used hidden cameras to record the plight of detainees held as part of the Howard Government's Pacific solution. "It worked because we looked like stupid blondes. We had these little cameras in bumbags around our waists, with sound and everything. We secretly filmed but I was nervous and bad at it..."
"They sidestepped visa restrictions by making a roundabout 10-day island tour, starting in New Zealand, ... entered Nauru on a three-day transit permit." "Van Boxtel's success is astounding." "In six-year-old Shayan Badraie's drawing, the stick figure of a boy and girl standing behind a razorwire-topped fence, tears streaming from their eyes as baton-wielding security guards hover menacingly in the background. From this two dimensional, black-and-white representation of life inside the Villawood Detention Centre, came the seed for an idea that spawned The Cage House..."
"Australian Liam Barry went to Nablus as part of a protest movement but he and the other seven foreigners arrested later weren't demonstrating or protesting but instead had entered the Balata refugee camp urging soldiers not to damage homes as they searched them and arranging for injured people to go to hospital. Israeli troops didn't stop him from entering Nablus and at first soldiers he encountered during Israel's invasion of the city ignored the foreign nationals but that changed late on Saturday when Israeli soldiers surrounded the group and at gunpoint ordered them into a truck. It would now appear that Israel intends to deport the eight for no more than being in the area despite the fact that Nablus would actually be under full Palestinian control were it not for the Israeli military invasion and that Israel has no legal jurisdiction inside the city. Liam Barry said he and the others arrested had been manacled hand and foot during their ordeal and were now being moved again." 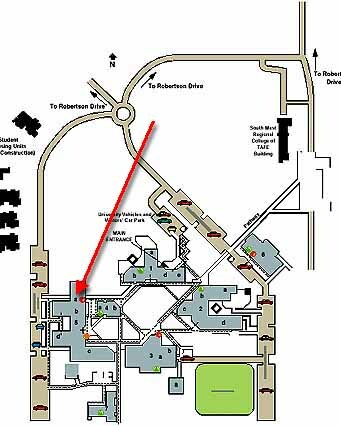 The red arrow on the map below points at Building 5, in the approximate vicinity of Rooom 16. We'll provide pointers to the right area around Campus for you.